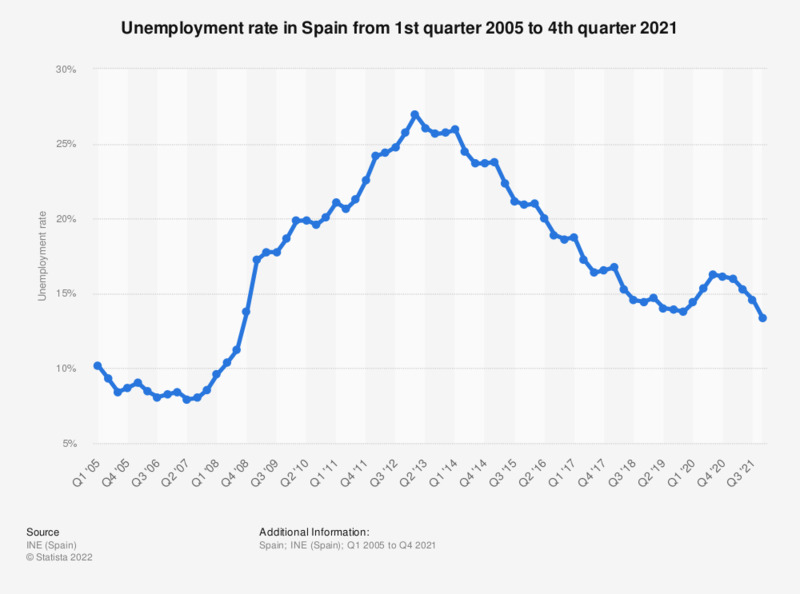 This statistic displays the unemployment rate in Spain from the first quarter of 2005 to the second quarter of 2018. As of the third quarter of 2005, the unemployment rate in Spain was at roughly 8.4 percent, in the same quarter of 2012 it increased resulting in a rate of around 24.8. As of the second quarter of 2017 the unemployment rate was 9.72 percent lower than its peak, the peak occurred in the first quarter of 2013 before fluctuating somewhat in a downward trend. Interestingly, the first quarter of each year after 2013 experienced a slight rise in unemployment, although, this trend is not reflected in the quarterly unemployment figures in Spain. The age group with the highest distribution of unemployment occurred among teenagers (16 to 19 years). Recent quarterly unemployment figures in Spain show that unemployment peaked in the first quarter of 2013, whereby there were approximately 6.28 million inhabitants unemployed, by the same quarter in 2017 unemployment had decreased by over 2 million. This trend is also reflected in the number of people in employment in Spain. * The source adds the following information: "The Economically Active Population Survey (EAPS) has been conducted since 1964. The methodology currently in force is that of 2005. It is a quarterly continuous research focusing on families, whose main purpose is obtaining data on workforce and its several categories (employed, unemployed), as well as on population out of the labOr force (economically inactive population). The initial sample is about 65,000 families per quarter, which equals approximately 180,000 persons." In your opinion, how will be the future social and economic position of those who study or start working in Italy today, in comparison with the previous generation?